Successfully Added Sunroad Digital Sports Watch FR861 B - Compass, Altimeter, Barometer, Pedometer, Calorie Counter to your Shopping Cart. Sunroad has over ten years of expertise in the wearable market. crafting digital timepieces for the adventurous outdoor types. The FR861 B is a packed full of functions that make this watch a Swiss army knife of wearbles. It brings all the information any outdoor lover needs direct to your wrist. Mountain climbers, fishermen, hikers, skiers, hunters and mountain bikers will all benefit from the features. A compass ensures you'll always know which way is home while barometer and 24 hr air pressure chart will let you predict upcoming changes in the weather hours in advance. With the watche's altimeter and trend chart you can see how far you have climbed over the last 12 hours, a useful tool for mountaineers and well as hikers. Pedometer, step counter, calorie calculator, and distance traveled are all just the touch of a button away and mean you'll be able to track every step weathered it's a long hike or a short stroll to the store. Now you can see just how healthy you are and keep on track no matter where you roam. Rated to 5ATM this watch is suitable for all conditions and can accompany you in the water without fear of getting damaged from the wet. Around the stylish circular and tough looking display are 4 buttons to access all the functions. You can scroll through settings, recall past data and select from any of the world time zones. Coming with a clear and concise English manual you'll find all the features easily at hand. 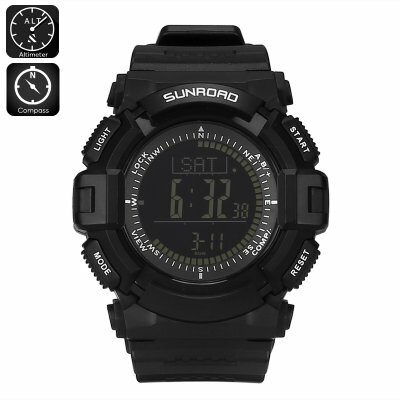 This sports watch from Sunroad is comes with a 12 months warranty on all our ad is brought to you by the leader in electronic devices as well as wholesale sports watches..